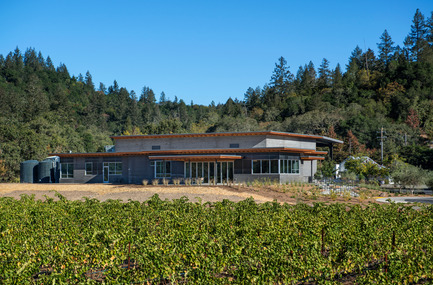 The Southwest corner of Titus Winery is characterized by the covered hospitality area overlooking surrounding vineyards. 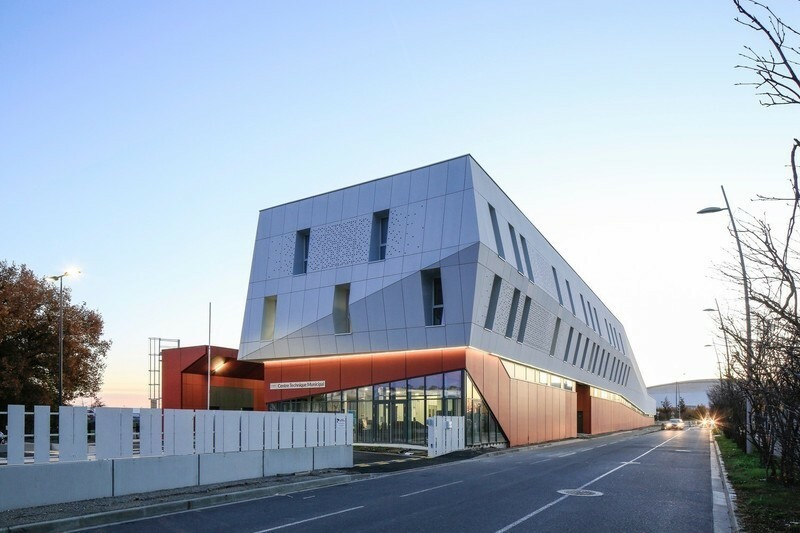 Exterior materials include cedar soffits, concrete board-form tilt-up walls, gunmetal blue panels above windows, and anodized aluminum window frames. 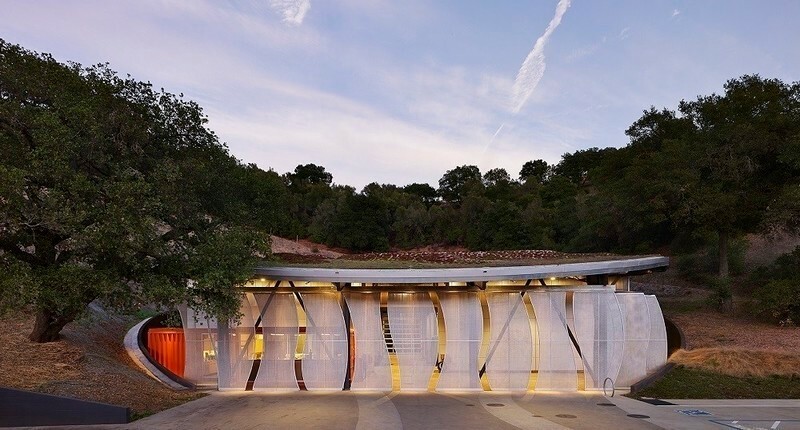 The main entrance of Titus Winery is a balanced composition of varied-height, layered horizontal roof planes. 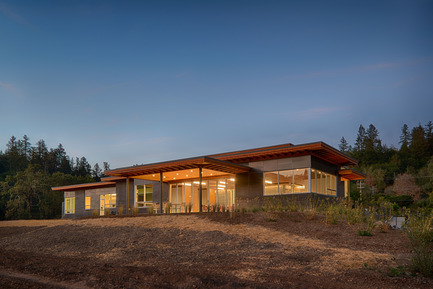 Exterior materials include cedar soffits, concrete board-form tilt-up walls, gunmetal blue panels above windows, and anodized aluminum window frames. 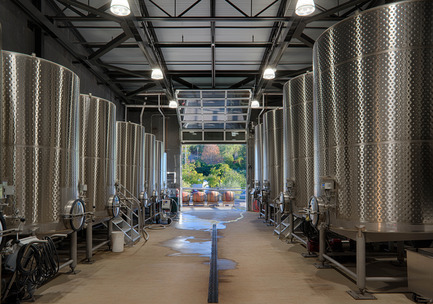 Lined with 6000-gallon fermentation tanks on either side and a metal truss roof above, the Fermentation Room overlooks the Covered Crush area beyond. Fermentation is a six-week, highly-controlled process that involves the conversion of glucose to carbon dioxide, heat, and ethyl alcohol. 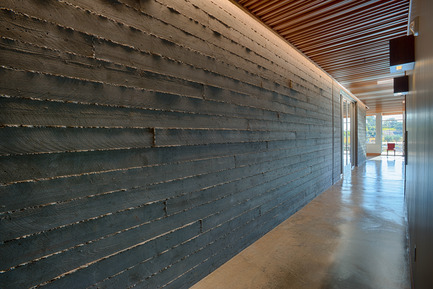 The concrete board-form walls that from the exterior façade continue at the interior and provide a textured surface for a recessed LED light above. 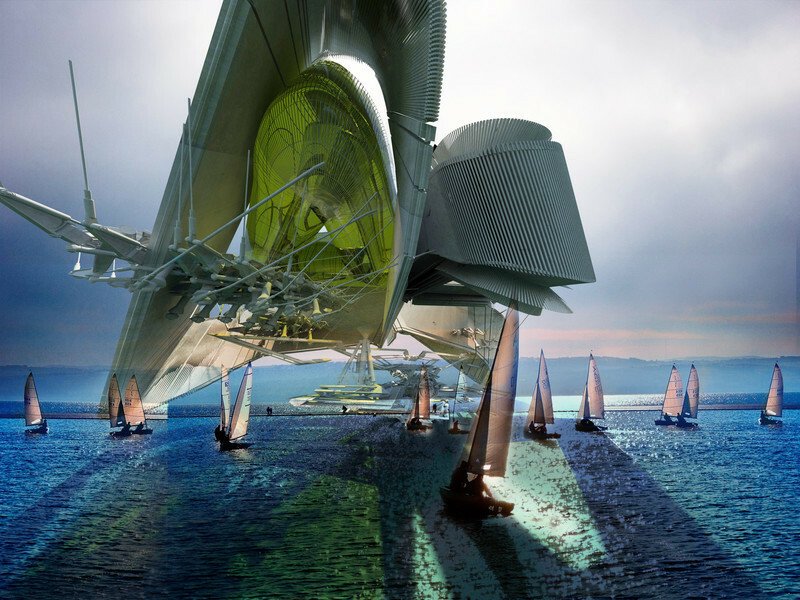 Matching interior and exterior finish materials allowed for a blending between the two spaces. 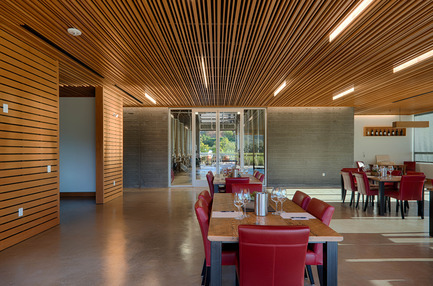 The suspending ceiling of the Hospitality Room is comprised of long horizontal slats of varied widths and depths with a view of the surrounding vineyards through bi-fold Nana Walls. Glass blade LED light fixtures hang between the slats in a staggered composition. 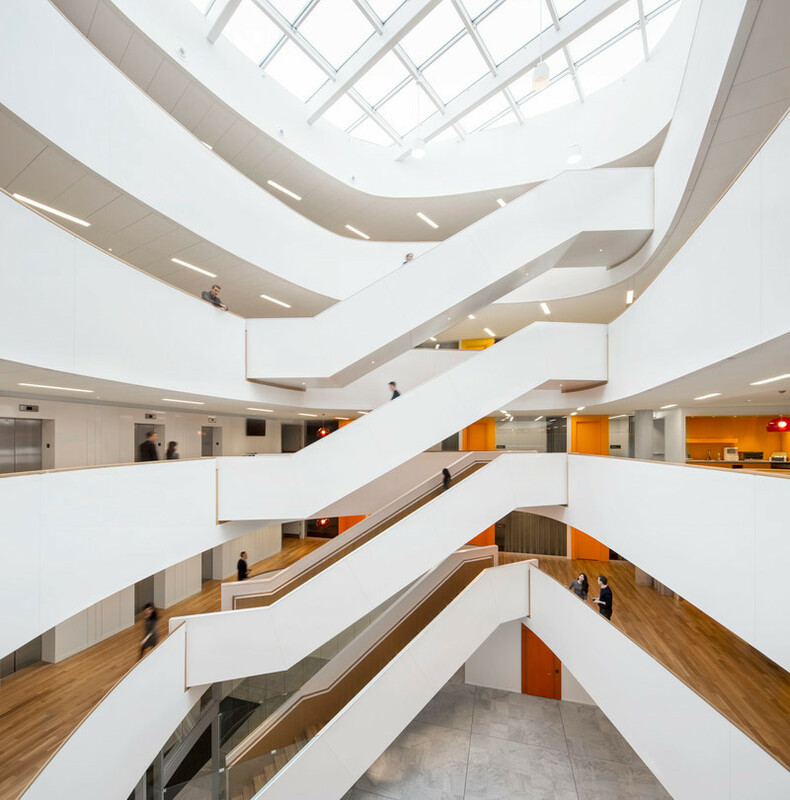 The slatted ceiling mitigates acoustical resonance and allows for flexible ventilation. The suspending ceiling of the Hospitality Room is comprised of long horizontal slats of varied widths and depths with a view of the Fermentation Room through the glass wall beyond. Glass blade LED light fixtures hang between the slats in a staggered composition. 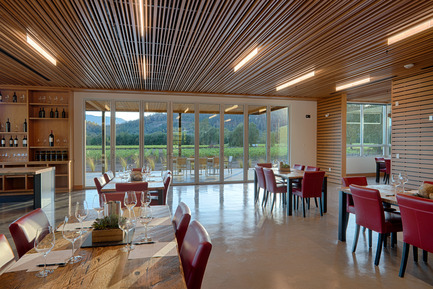 The slatted ceiling mitigates acoustical resonance and allows for flexible ventilation. 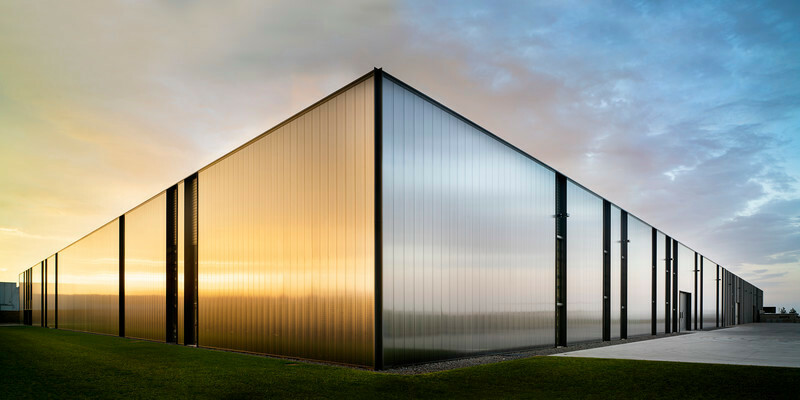 The west façade of Titus Winery is characterized by the covered Hospitality area overlooking surrounding vineyards. Exterior materials include cedar soffits, concrete board-form tilt-up walls, gunmetal blue panels above windows, and anodized aluminum window frames. 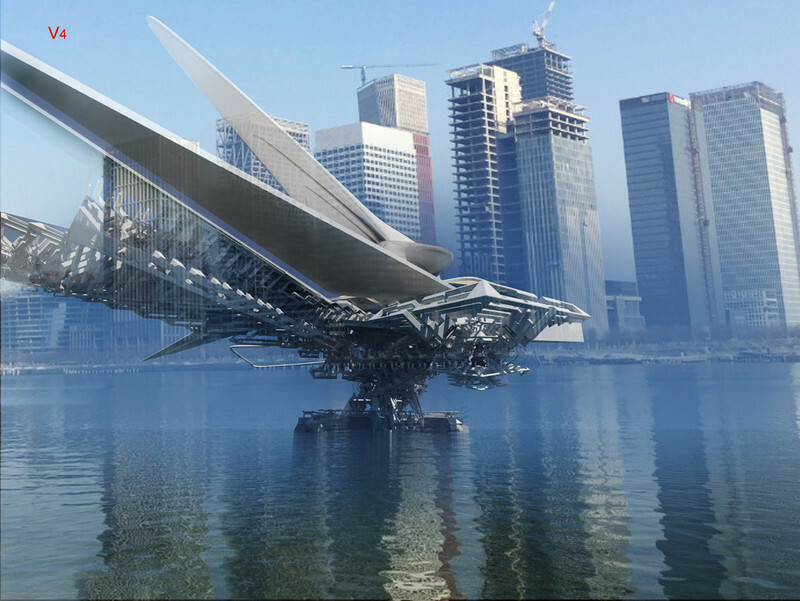 The building section of the Hospitality/Administration Building describes varied-height layered horizontal roof planes over Hospitality and Production spaces. 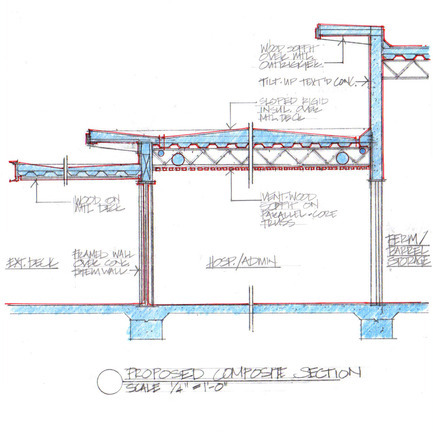 Construction assembly components include cedar soffits, concrete board-form tilt-up walls, gunmetal blue panels above windows, and anodized aluminum window frames. 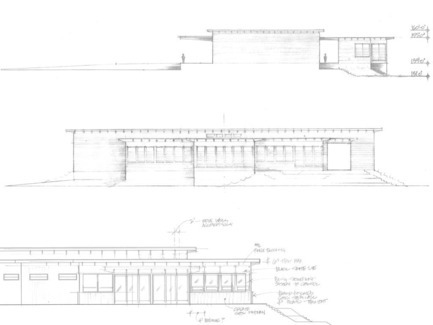 Early exterior elevation hand-sketches describing a balanced composition of varied-height, layered horizontal roof planes. 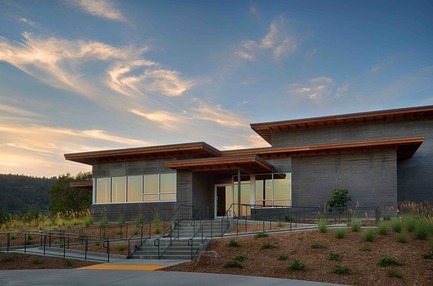 The building was raised on an earthen berm to mitigate flood risk from the nearby Napa River. 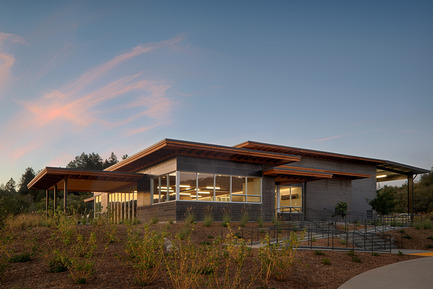 Exterior materials include cedar soffits, concrete board-form tilt-up walls, gunmetal blue panels above windows, and anodized aluminum window frames. 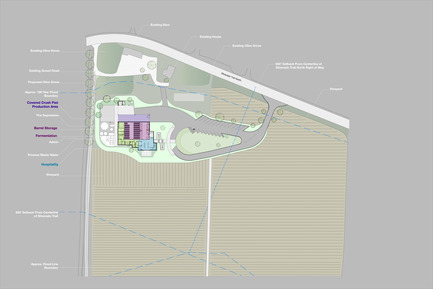 The site plan demonstrates that the building location was determined by a variety of local constraints including the Napa River flood boundary line to the West, Silverado Trail to the East, historic structures on the property, and traffic considerations associated with the nearby blind curve. 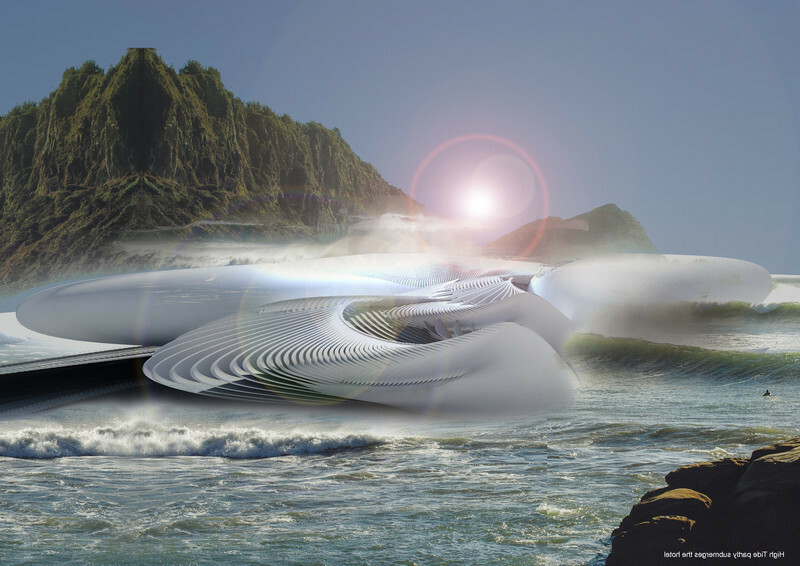 The building was raised on an earthen berm to mitigate flood risk from the nearby Napa River. 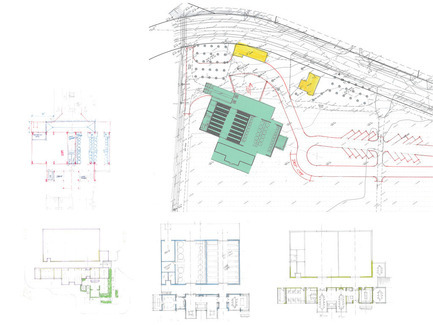 The early hand-sketches describe the evolution of the building plan with relation to the site plan. 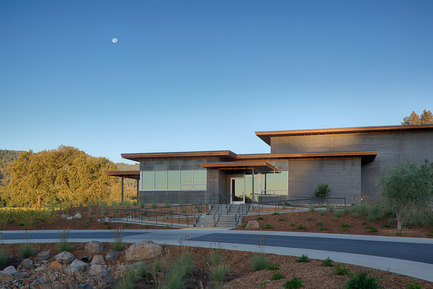 The building was raised on an earthen berm to mitigate flood risk from the nearby Napa River. 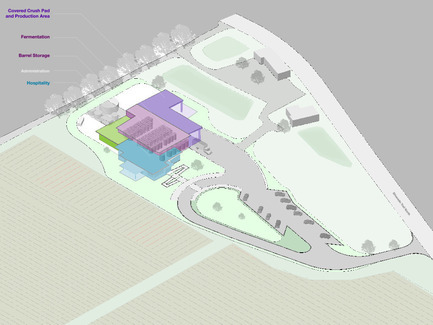 The 3D-view of the Titus Winery project site depicts all the major project components including the Covered Crush Pad, Production Area, Fermentation, Barrel Storage Room, Administration, and Hospitality Room. 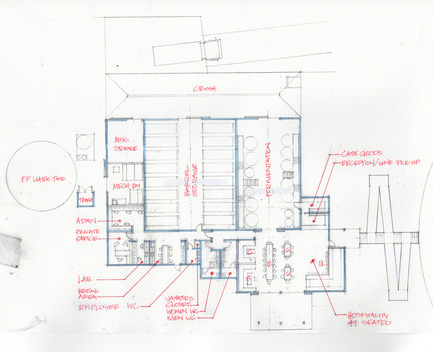 A hand-sketch of the Titus Winery building plan illustrates the integration of Hospitality and Production spaces in one unified composition. 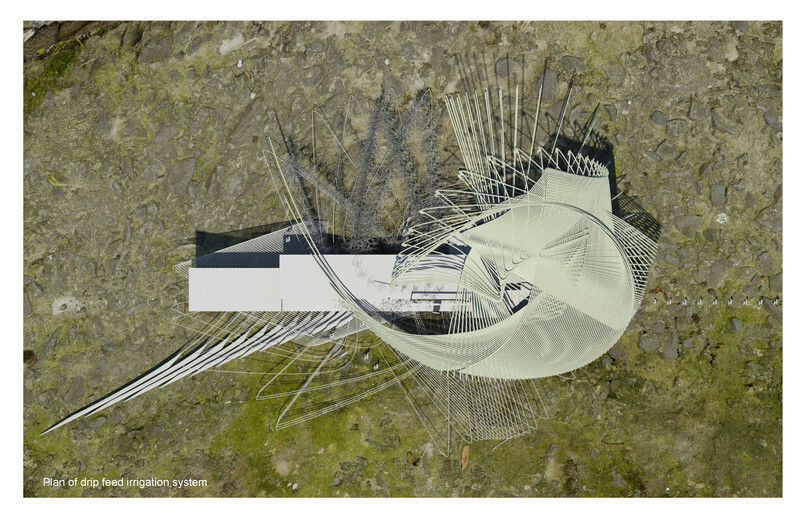 Hospitality spaces cluster on the west face of the building to take advantage of the vineyard view while Production spaces face the nearby road to expedite the flow of winemaking.